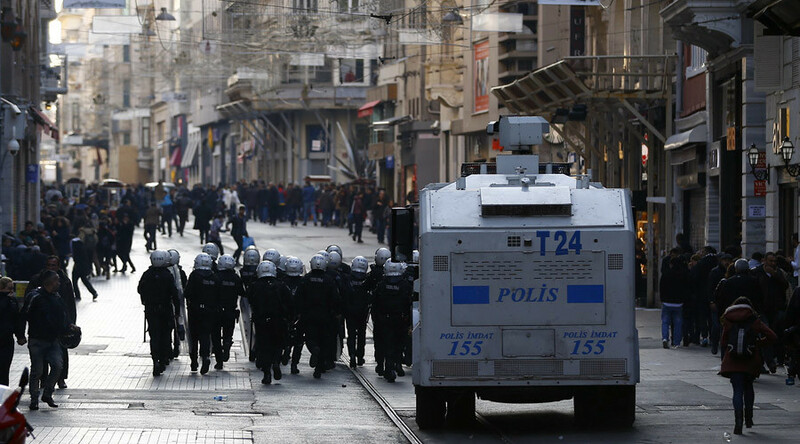 In Istanbul, riot police chased protesters and pushed shoppers and tourists out of the way. Shops closed their shutters and at least two protesters have been detained. On Thursday, Erdogan stated the PKK fighters would be "annihilated." The army claims more than 100 suspected militants have been killed over six days, with two soldiers and five civilians also said to have been killed. The operation largely targeted Diyarbakir, Sirnak and Mardin provinces. The Turkish army also conducted air strikes on suspected PKK sites in northern Iraq on Friday. Police also fired water cannon and tear gas at thousands of people protesting against the offensive in Diyarbakir on Friday.